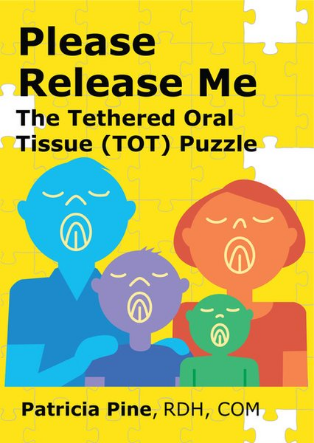 Please Release Me - The Tethered Oral Tissue Puzzle is for anyone with a tongue. This book is about awareness for patients and professionals on tongue-tie, lip-ties, all tethered tissues, who to see, exercises, what questions to ask. It will be a great resource for parents, patients, and professionals. Keep this book in your pocket for quick reference, share with your referral resources. This book will be released any day! Thank you for your patience. International shipping fees apply. What Professionals are Saying about this book! This is a great reference book for patients and families trying to navigate the health system with tongue tie concerns. It will also be a useful resource for allied health professionals as it covers all aspects regarding recognition and management of this anatomical tissue that can impact so many areas of the human body. I have learned so much from reading your book. It's simple to understand, and precise. I feel I will be such a better hygienist! This is what I have been waiting for! So many children with TOTS out there. Great education for us in the dental field and for families experiencing trauma due to undiagnosed ties. Thank you, Pat!! It is hard to believe, that with all the experience and information available today, for parents as well as the medical and dental profession, infants and mothers are still left to suffer needlessly with breastfeeding problems. Most of these problems care usually traced to a poor latch of the infant onto the mother’s breast. Either through missed diagnosis or misdiagnosis many mothers are forced to switch to formula and give up breastfeeding. This often occurs because either parents are told their infant does not have any type of tethered oral tissue or even worse, that tongue and lip-ties have nothing to do with breastfeeding. Successful breastfeeding requires the effort of the entire breastfeeding team. From diagnosis to post-surgical after care, the entire team needs to be available to help the mother and infant overcome the effects of a poor latch once the tissues have been correctly revised by an informed, understanding and skilled surgeon. I have been a speech/language pathologist since 1978 and a certified oral myofunctional therapist since 2010. When I had my training in 2005 and spent some more time learning about oral myofunctional disorders, I realized my then 25-year-old son was tongue tied. I do not recall all the symptoms we may have had when I nursed him; however, I recall clearly how difficult he was to settle down to go to sleep and I don’t even remember when he finally slept through the night. So now, when I talk with parents of infants and children about ties who have heard from a physician or LC or some other professional that ties are over diagnosed and a fad, I tell them that I know that really, the haven’t been identified in the past because not only is my son tied, but so is my husband. Thanks Pat for writing this concise and thorough resource that anyone will have time to read. This book needs to be a pocket reference for all pediatricians, ENT’s, parents, lactation consultants, speech/language pathologists, dentists, hygienists and oral myofunctional therapists. I, for one, can’t wait to begin to give it to the professionals that I collaborate with regarding ties. Even as a mom and grandmother, I had no knowledge of tethered oral tissues (TOTs). Reading Pat Pine’s book not only taught me about this medical problem and opened my eyes to the widespread suffering TOTs cause, it explained where to go to get help. This book will be a godsend to many, many families.